We are supposedly a nation of laws, not men, but our lawmakers have ensured over the years that we are increasingly at the whim of men, elected or appointed, instead of the law. Attorney General Jeff Sessions has declared that he will reverse an Obama Administration position allowing states to decide on marijuana legalization. Now, local United States Attorneys will be empowered to decide. But neither the Obama Administration nor Jeff Sessions should do anything other than enforce the law, and federal law criminalizes marijuana. The solution here is not to ignore the federal law, but to repeal it. To do otherwise empowers individuals beyond the rule of law and puts the whims of officials ahead of the will of the people. Near where I live, a local police officer pulled over a man for the audacious offense of driving while eating. There was no complaint and there was no evidence that the man was distracted in his driving. But the young police officer decided to use the distracted driving charge to ticket the man, whose local officials eventually threw out the citation. We live in an age where there are more and more complaints of overzealous police officers and overzealous cities nickel and diming the citizenry on old laws. The correct remedy is to repeal stupid laws. Again, as long as the law is on the books, it allows a bureaucrat or politician to have extraordinary and capricious control over your life. It allows politicians to change their minds and reverse other policies. It puts men ahead of the law. And our Congress is notoriously good at passing laws then abdicating their constitutional responsibilities to bureaucrats who they can blame at election time. You may think there is nothing wrong with legalized marijuana. All but three states now have some form of legalized medical marijuana and several states now have legalized recreational marijuana. California is the latest and also a case study in the legalization of marijuana as a new form of revenue and regulation. Regardless, as long as a federal law is on the books making marijuana possession a criminal act, a bureaucrat in Washington can wipe out the market and a thriving industry. You can scream all you want that they should not do it, but they can and the only thing in life more certain than even death and taxes is that a bureaucrat will act arbitrarily and capriciously when the mood strikes. This, though, is the logical outcome of the federal government stepping in to the criminal law field, something our founders would be appalled by. Tough on crime politicians run for federal office insisting they will make federal criminal laws and the result is placing people in situations where they can be prosecuted under a state law, then have a federal prosecutor prosecute them for the same thing when a U.S. Attorney seeks to build his name for his own run for office. No, it is not double jeopardy because the federal government and state governments are separate entities. Ironically, many of the tough on crime politicians getting elected to expand the federal criminal law are also Republican politicians who claim to want to return power to the states. When John F. Kennedy was assassinated there was no federal law criminalizing the assassination of a President. Only in 1965 did Congress act. Now we have a federal crime for virtually anything you can think of and federal bureaucrats with their own SWAT teams to enforce not just criminal laws, but bureaucratic regulations. Congress should scuttle most of the federal criminal law in an effort to restore the balance of power to the states. I am indifferent on marijuana legalization, but many states are not and Congress should let the system and rule of law work instead of undermining the rule of law by empowering the arbitrariness and capriciousness of men. If the “rule of law” mattered, Marijuana Prohibition could not have happened without a Constitutional Amendment. The correct remedy is to repeal stupid laws. Agreed. The hard part is agreeing on which laws are stupid. When John F. Kennedy was assassinated there was no federal law criminalizing the assassination of a President. Because a Murder charge was just not enough! 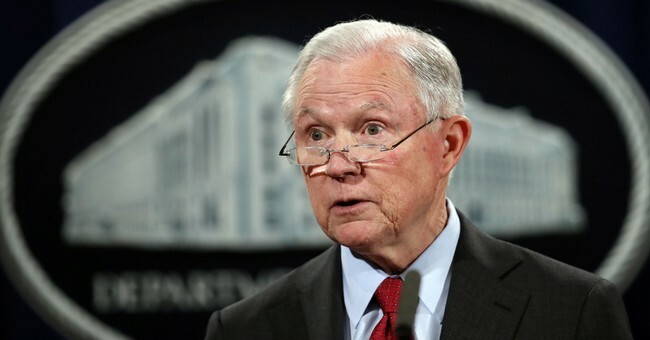 Attorney General Jeff Sessions has declared that he will reverse an Obama Administration position allowing states to decide on marijuana legalization. While that was the intended effect of the Obama admin position, the position was explicitly framed to order US Attorneys to ignore federal law as official policy. Which is anathema to the rule of law. Congress needs to rescind any federal laws criminalizing marijuana if they want it to be treated as a state's rights issue. Legalize it, tax it, and the marijuana drug wars dry up, the jails are emptied from non-violent criminals caught up in the drug war. However, the law enforcement groups hate this because it takes away a big chunk of their illegal money through seizures of cash and property on the excuse that it MIGHT be used for drug purchases. It’s time to stop playing with semantics and either make it legal or not. If not, enforce the law. I think the states that have made weed “legal” are setting their citizens up for a potentially bad experience. They are given the impression that weed is legal—until the feds show up, throw them in jail and take their house—if they feel like it. If that is the desire, then the laws need to change first. I would caution that certain jobs come with significant liability when performed under the influence (including both alcohol and drugs). The lack of a test showing influence at the time (as opposed to the 20+ day residuals) for pot means that pot smokers would still need to be barred from such employment, for protection of the employer. Legal does not necessarily mean safe. The RoL phrase is being misappropriated by the left. This is no accident. Legalizing pot was just another straw in obozos effort to destroy America. Fry some more brains of the young so they can be controlled better. The much bigger problem is that Sessions could have back-burnered this silliness, turning it over to congress; but instead he intends to waste huge amounts of time and money on this instead of doing his job. After a year in office, Sessions should have asked for, and gotten from President Trump, a dozen or more special prosecutors to investigate the vast and ignored corruption in the government and the Democrat party. After a year in office, by now, hundreds of criminal indictments should have been issued, and federal trials should well be underway. Since Sessions has not done this, he needs to get out of the way so someone else can do so. So the big question is who to put in his place to get the ball rolling? On Fox Business this morning, the discussion turned to pot. It seems, and it's never reported, employers are unable to fill job vacancies because many applicants can't pass drug tests for employment. Seems the same thing is going on with the military. >>Which is anathema to the rule of law. Supremacy Clause vs. 9/10 Amendments. Once again on a collision course. AFAIAC the feds have NO business in the illegal drug trade. It is NOT a federal issue. I know it’s almost like a joke to say this will lead to worse things. Like allowing a few million illegals to break the law. Or, abortion which started out as 3 trimester and is now just shy of infanticide. Next thing you know men are marrying men and transgendered meles are showering with your daughter. The mj argument in no time went from those poor souls with medical ailments to recreational use in 2 or 3 years? Follow the money. There is much more money (and power) to be made through prohibition of otherwise peaceful behavior then there is to live and let live. Politics is a scam and were suckers for playing. If a Constitutional Amendment was required to ban alcohol why is one not required to ban marijuana? It’s legal is so many states, and the states that mass produce it ship it to the states where it’s not legal because there’s tax-free revenue to be had. If we legalized it across the board, a rather large new market would open, along with the jobs it brings. It would bring a lot of new jobs. If we try to push it back into illegality, it will cost money to continue to fund the highly unpopular war on drugs. Lots of people will be jailed, again, for victimless crimes. And the people who want to smoke pot will keep smoking pot anyway like they have been doing for years. The only downside to legalization that I can see is that you are setting a precedent for people to legalize harder drugs. As a Libertarian I think people should be able to make the basic choice of what they want in their system without the government involved; as a father I realize the dangers that creates for the next generation who is dealing with things like heroin, which can rewire your brain in a very short time.